One block to famous Clary's, this is one of the most desirable locations to stay at in Savannah! Are you planning an amazing vacation to Savannah, Georgia? If you are, then you want to make sure to book your stay at Savannah vacation rentals instead of a hotel. 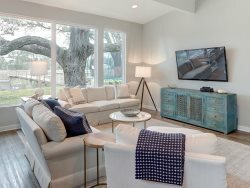 When you book vacation homes for rent Savannah at Southern Belle, you're getting a one of a kind experience in a fully furnished home right in the desirable downtown. You have so many more options when you stay in vacation rentals Savannah GA, including plenty of room to stretch out and the option to cook in instead of eating out. One of our cozy Savannah vacation rentals for one or two is the Romancing on Jones property. It's just under 1,000 square feet and has one bedroom and one bathroom. This is the type of vacation homes for rent Savannah perfect for a couple or individual stay. The property includes private parking and is only a block away from Famous Clary's. Like our other vacation rentals Savannah GA, this property has a wealth of amenities to rival any hotel's. It includes free Wi-Fi, cable TV, a washer and dryer and stainless steel appliances among others. Walking into this property you will find a cozy living room with modern and trendy decor. Several windows let in plenty of light and a decorative fireplace adds ambiance. The kitchen also features a window and lots of light. Counter space is ample and all necessary appliances are provided. A cozy dining room has seating for four at a round table. The queen bedroom is extra roomy with a decorative fireplace, seating area and curtained bed. The bathroom is right nearby and features a large vanity and shower. As with all of our Savannah vacation rentals, you will find this property fully furnished, cleaned, and stocked with necessities upon your arrival. Southern Belle's vacation homes for rent Savannah are located in prime spots to explore the downtown area and places nearby and this one is no exception. Not far from this home is Lafayette Square, as well as Flannery O'Connor's childhood home and the Cathedral of St. John the Baptist. Other nearby attractions include Troup Square, Calhoun Square and plenty of dining options. When visiting Savannah, there's so much to see and do that you might feel overwhelmed. To start, it's easy to get around most of the town by walking. You can also utilize the Chatham Area Transit for free on and off service in the historic district. Probably the number one attraction in Savannah is the massive, 30 acre Forsyth Park. Savannah has numerous parks and squares throughout, but Forsyth is easily the biggest and most famous. While here you can visit the Forsyth Fountain, Garden for the Blind, war memorials and the 300 year old Chandler Oak tree. It's a great place for walking, people watching or even a picnic. There's also a cafe in the park if you get hungry. The second most popular attraction in Savannah might be all the history tours available. You have the option of the Old Town Trolley Tour, horse and buggy tours and walking tours. You can take themed tours too, from Civil War tours, architecture tours, ghost tours and more. Two great areas to find copious amounts of shopping and dining are River Street and the City Market. From River Street, you can also enjoy a river boat cruise or take a dolphin watching tour out onto the river. If you have extra time to spend in Savannah or just really need to see the beach, then a trip over to Tybee Island might be the perfect getaway. It's only a half-hour drive from downtown and you'll find several beaches, opportunities for fishing, plenty of dining options and the old Tybee Lighthouse and Museum awaiting your arrival. Before you book any old hotel, stop and consider Savannah vacation rentals. Southern Belle's vacation homes for rent Savannah not only include many of the same amenities you'll find in hotels, but also the privacy and room that you won't get in a hotel. We have a huge range of vacation rentals Savannah GA to choose from, whether a cozy downtown townhouse for two or a stately mansion big enough for two families. Call us today and find your perfect vacation home. The location and bedroom of the property itself are amazing! The condo was in an amazing location and beautifully appointed. It was wanting for nothing. Very comfortable and clean. Very friendly. I put in a maintenance request for what I thought was a malfunctioning shower... which turned out to just be me and my fiance not understanding how the shower worked, haha. The maintenance guy was very friendly and didn't mind the trip even though there was nothing really wrong. This was our second stay with you guys, and we really enjoyed it. Very smooth process and the units have been great. We liked the proximity to downtown Savannah. Loved how the property was decorated and the comfort of everything inside. Timely response, courteous and helpful. A+ !! Excellent. Helpful, resourceful, kind and prompt. Simply the best! I really enjoy every detail and everything about it! Thank you! Professional, friendly and very nice to work with. Beautiful and well appointed! Location was awesome - you can walk everywhere. Best vacation sleeping - the bed/bedroom was soooo comfortable!